When it comes to cast glass, it's often not very reasonable to hold the piece on a flat lap grinder or up against a belt sander for long periods of time. Cast glass can be very heavy and unwieldy and your arms, hands and back can suffer for it. It can be advantageous then to bring the grinder to the glass and this is where water fed right angle grinders come into play. There are a number of choices when it comes to right angle grinders from electric grinders that require no air compressor but will weight more and can fatigue users faster to pneumatic air powered grinders that are lighter weight and more versatile but will require larger air compressors to operate them. Even within the electric or pneumatic choices there are choices of the size and weight of grinders and their subsequent price points as well. With pneumatic grinders there are even choices between the larger grinders that accommodate backer pads from 3 inches in diameter all the way up to 5 inches in diameter and the smaller, lightweight and versatile LXB-10 grinder that we'll show you in the videos that accepts only a 2 inch diamond disk. Angle grinders will follow some of the same routines as flat lap grinding but with a few more steps. Since it is difficult to cover the entire area in one grind like you can with a flat lap grinder, you'll generally want to add more steps to the grinding process to make a smooth transition on the glass. For larger surfaces you'll need to start with rougher grits like a 60 grit or even disks like the BabyRok or Ceramica disks. Smaller areas or edge work can start with finer grit disks to make for shorter processes. After working your piece with Electroplated Diamond Disks, it's still going to be too rough a surface to polish from either chemically with cerium or by fire polishing. Even at an 800 grit Electroplated, the surface will need to be worked further. This is where disks like the 3M Electrostatic Diamond Disks come in. These disks are a paper backed product that have the diamonds adhered to the backing and then electrostatically charged while the adhesive cures so the diamond "stand up" on the surface of the disk, but will bend slightly when the glass contacts the diamond. This gives an extremely fine surface on the glass that is excellent to polish from. 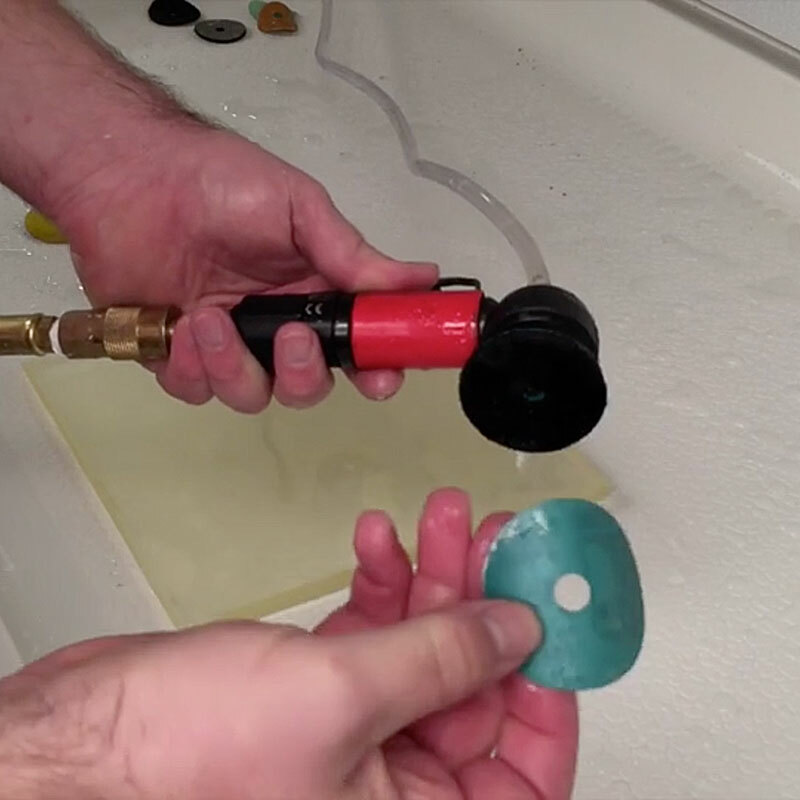 While the electrostatic diamond disks do a fantastic job of finishing glass surfaces, as the video to the right will attest, there are other options for finish work on your glass with a right angle grinder. Depending on the size of your surfaces or the finish you need to obtain, you may be better served by the resin diamond smoothing disks which are the same as our larger smoothing pads, but Velcro backed for use with right angle grinders. We also carry the Polpur Lapi-T disks with a Snail Lock backing that can be used for larger flat surfaces with a right angle grinder for beautiful finished surfaces but with a longer life than electrostatic diamond disks. With cast pieces oftentimes they are placed back into the kiln for slumping or fire polishing and leaving the surface at the electrostatic disk stage or any of the other finishing disk stages is all that is required to achieve an excellent fire polish on the surface of the glass. There are other situations though where you will need to chemically polish the surfaces with cerium. We have options that include the 3M cerium impregnated Trizact disks with Velcro backing that polish surfaces with just water and no extra cerium slurry required. They polish quickly and efficiently, but will have a shorter lifespan. We also have felt disks that can be used with cerium slurry for polishing your surfaces after the finishing disks.